Sure, it’s a little pricey, but it is a good wine for a special occasion. I found it for $16.99; at that price you could buy two for the first part of the meal, and then finish things off with either a fine, but less expensive, California Viognier, Pinot Noir or Zinfandel. 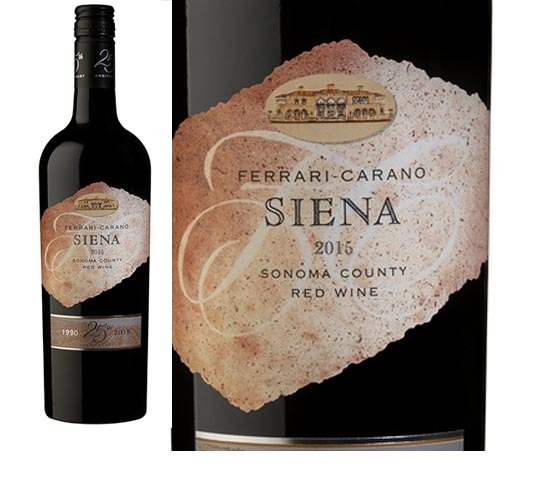 Ferrari-Carano Siena was a favorite wine of the late Don Carano, who along with his wife and business partner, Rhonda, founded the winery in 1981 in Sonoma County’s Dry Creek Valley, Rhonda Carano said in article this year in BIN, a beverage industry news publication. The winery is one of the largest producers of Sangiovese grapes in Sonoma County, and Siena, named after a city and province in Tuscany, is a Sangiovese blend. With Rhonda’s help, Don Carano became a successful attorney, hotelier, restaurateur and wine producer, who changed the gaming industry in northern Nevada with the first mega-resort, the Silver Legacy. He also had a fondness for northern California and was a major contributor to the growth of winemaking in Sonoma. He strongly believed in sustainable farming and balancing grape growing with the rest of nature. And he was a philanthropist, a gentleman and a nice guy, according to various published obituaries and remembrances. Carano was born in 1931 in Reno. He graduated from the University of San Francisco, and after a stint in the Army, he returned to USF and received a law degree. After graduating with honors, he moved back to Reno and practiced law before opening the Eldorado Hotel and Casino in 1973. Eldorado Resorts is now a publicly traded company that has 19 properties in four states and more than 14,000 employees. Don Carano, who died on Oct, 3, 2017, had a strong commitment to making excellent wine. Rhonda Carano has taken the reins of Ferrari-Carano Vineyards and Winery as CEO and is striving to uphold her late husband’s principles. “Our philosophy since day one has always been in quality, value and consistency without compromise, making wines that are approachable upon release,” she told BIN. The company, which has 1,900 acres of vineyards across three California counties, is certified sustainable and green under the state’s qualification requirements. Ferrari-Carano started making Siena in 1990, and the 25th vintage received a 90-point rating from Wine Spectator magazine. The wine is a blend of Sangiovese, Malbec, Cabernet Sauvignon and Petite Sirah. It’s made from select lots of grapes harvested from three company-owned Sonoma vineyards, Associate Winemaker Rebecka Deike says in the tasting notes. Deike oversees red wine production for Ferrari-Carano. The grapes are initially fermented in stainless steel tanks, and then for 14 months in new and older French and Eastern European oak barrels before bottling. The 2015 vintage was released in February. The result of Deike’s efforts is a wine with depth, lots of fruit flavors and aromas and a smooth finish with subtle tannins, the tasting notes say. Siena is available in New Hampshire and Vermont, but you may have to ask your wine store to order it. I found it at Norwich Wine and Spirits, and it’s also available at the New Hampshire Liquor Stores. Deike recommends pairing Siena with a wide range of foods from pasta and pizza with flavorful sauces and toppings to chicken cacciatore and duck salad with raspberries or oranges. Her food recommendations, lumped together for one meal, has the ring of something like a Thanksgiving dinner, a variety of seemingly unrelated dishes that go well with the wine. By all means, try Siena with turkey, cranberry sauce and all the side dishes. I think you’ll be pleased with how well it matches with the broad range of flavors.